The average cost of memory care in Madison County is $5,097 per month. This is higher than the national median of $4,650. Caring.com has helped thousands of families find high-quality senior care. To speak with one of our Family Advisors about memory care options and costs in Madison County, call (855) 863-8283. Madison County is located in the west-central region of Mississippi and has a population of about 105,000 people, about 13 percent of whom are aged 65 and over. In this county, it's projected that over 13 percent of the seniors who receive Medicare benefits have Alzheimer's or dementia. 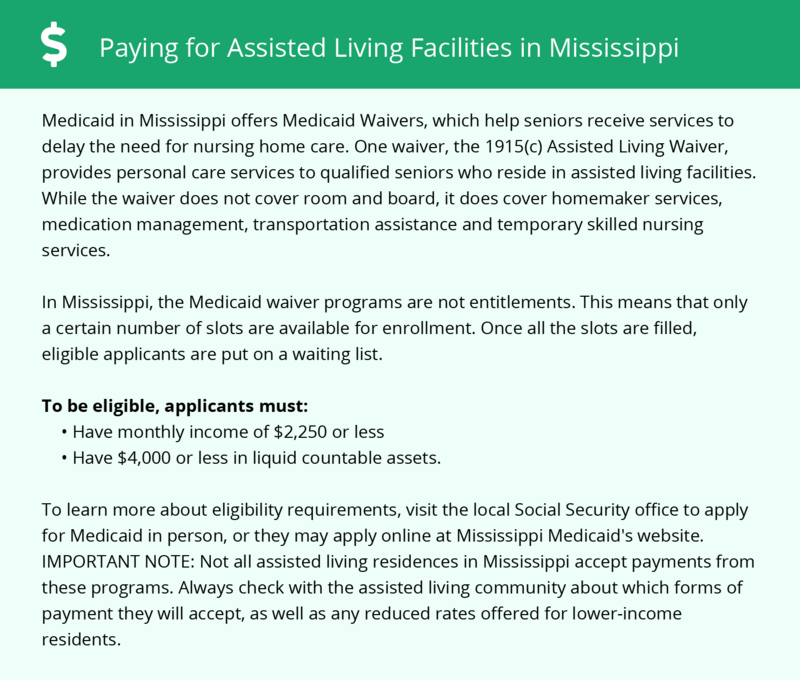 In Madison County, as in all of Mississippi, memory care facilities are situated within licensed personal care home-assisted living facilities. These facilities must have separate Alzheimer’s disease/dementia care units and meet special requirements regarding staffing, staff training and facility design standards. Madison County is home to three memory care facilities, including two in Ridgeland and one in the city of Madison. In Mississippi, seniors do not pay state income tax on any type of retirement income, including Social Security benefits, withdrawals from retirement savings accounts and disbursements from pensions. This may allow for more money in the memory care budget for Madison County. Madison County receives 56 inches of rain annually and virtually no snow, and residents enjoy an average of 215 days of sunshine every year. Over the course of a year, temperatures in this county range between 35 degrees and 92 degrees, versus the national average of 23 degrees and 86 degrees. The region's warmer climate may appeal to families whose senior loved ones enjoy spending time outdoors. On a 100 point scale, with a lower value representing less crime, violent crime in Madison County is several points higher than the national average at 37.1, but the rate of property crime is a little lower than the national average at 36.8. Memory care facilities keep residents and their belongings safe by installing features like alarm systems and security cameras. Madison County is a relatively expensive place to live, which may leave less money in the budget for local memory care fees. The overall cost of living in this county is about 3 percent higher than the national average and 15 percent higher than the state average. Memory Care costs in Madison County start around $5,097 per month on average, while the nationwide average cost of memory care is $4,799 per month. It’s important to note that memory care rates in Madison County and the surrounding suburbs can vary widely based on factors such as location, the level of care needed, apartment size and the types of amenities offered at each community. Learn more about these programs, plus who’s eligible, on our Memory Care in Mississippi page. For more information about different ways to finance memory care, visit our Memory Care in Mississippi page. Madison County and the surrounding area are home to numerous government agencies and non-profit organizations offering help for seniors searching for or currently residing in an assisted living community. These organizations can also provide assistance in a number of other eldercare services such as geriatric care management, elder law advice, estate planning, finding home care and health and wellness programs. To see a list of free memory care resources in Madison County, please visit our Assisted Living in Mississippi page. 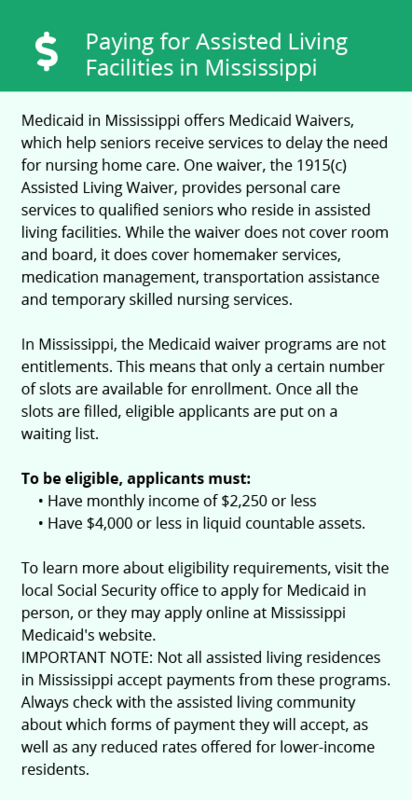 Madison County-area assisted living communities must adhere to the comprehensive set of state laws and regulations that all assisted living communities in Mississippi are required to follow. Visit our Memory Care in Mississippi page for more information about these laws.